Millions of Americans have no idea what "quantitative easing" is or how it will affect them personally. The recent announcement that the Federal Reserve will purchase another $600 billion in US Treasuries just adds to the mystery. Fed Chief Ben Bernanke claims his reason for buying bonds is that he wants to stimulate the economy. His real motive is more likely the need to push up housing prices to save the banking system. The banks may seem to have recovered, but they secretly hold millions of delinquent mortgages that are worth less than the value of the home. 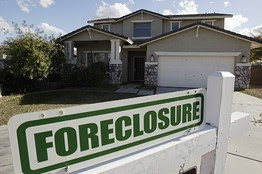 Rather than foreclose or sell the houses, the banks are just sitting on the mortgages, hoping for a miracle. There was testimony last week in the Senate from a Georgetown professor who said that the $400 billion in secondary mortgages held by the top four banks are only worth $200 billion. If these banks started writing off just these loans, it would wipe them out. Bank of America might be the first Wall Street giant to crash and burn. It has a $2.3 trillion balance and none of the loans for its subsidiary Countrywide Financial - the criminal enterprise at the center of the sub-prime securitization market – have been written off. The regulators and the CEO may say all is well, but stock investors have rendered their verdict. The value of Bank of America's outstanding stock is currently at around half of what it should be based on its “book value” - what the company says its holdings are worth. You can just sit on a house and wait for its value to increase. Abandoned homes only go down in value. There is a bank-owned house down the street from me that had the front door open all summer. You can't sell a house where the last residents were a family of raccoons. Many intercity homes have been systematically stripped of all their copper plumbing and fixtures. While Bernanke is trying to save the banks, he is making a series of bets that have their own negative consequences. Over the past three years, the Fed has purchased over $2.3 trillion in U.S. debt. If interest rates start to rise, the Fed could lose hundreds of billions of dollars on these bonds. The Fed also has a housing problem. It has made steady purchases of mortgage-backed securities, which increased from zero as of December 31, 2008, to over $1.25 trillion today. When Fannie Mae and Freddie Mac failed, the Federal Reserve added their loans to its balance sheet. Since the Fed suspended its rules against only accepting mortgage securities that are AAA rated, Bernanke and company may be holding a mountain of worthless paper. The money Bernanke is providing to banks has failed to get into the hands of businesses and consumers. U.S. commercial banks are increasingly using the cash provided by the Federal Reserve to lend back to the government. Since June, the biggest banks bought about $127 billion of Treasuries. Commercial and industrial loans outstanding have fallen by about $68.5 billion this year. The clock is rapidly running out on Bernanke's gamble. In 2006, the federal debt has increased by more than half. It now stands at $13.8 trillion and has morphed to 94 percent of GDP. With shortfall of $1.5 trillion projected for the next several years, the debt will quickly reach $20 trillion by 2015. I have been following the financial markets all my adult life, and am at loss to describe how hopeless the odds are against us solving this crisis. If the mortgage mess and debt bubble don't get us, contagion from Europe ’s debt problems or the looming pension crisis will sink us. Terry and I often talk about financial matters, and we believe this debt nightmare will unfold within the next couple of years. We can only guess where the Rapture fits in, but logic tells us it must be very near. “And when these things begin to come to pass, then look up, and lift up your heads; for your redemption draweth nigh" (Luke 21:28).